Facebook has been hit by scandal after scandal over the course of the previous year, but one of the strangest things that we have discovered is that none of these scandals seem to affect how much money the social media giant is earning on a quarterly basis. In fact, Facebook’s stock price is growing, and its earnings have been increasing steadily on a year by year basis. 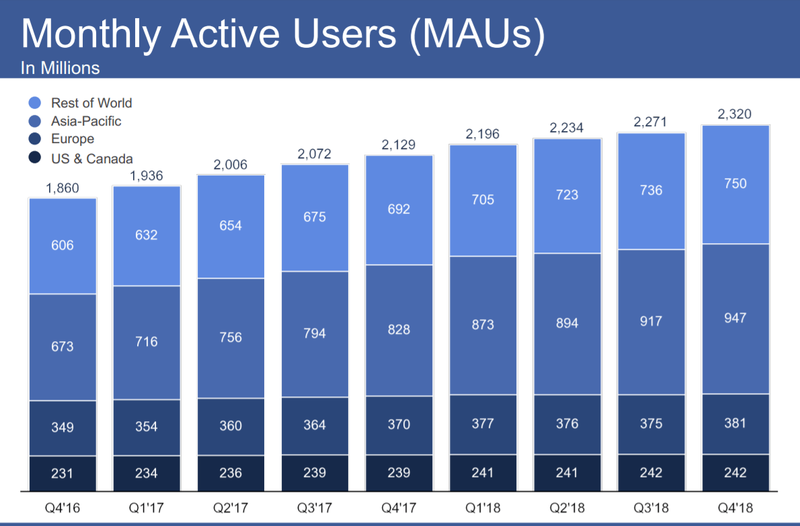 According to Facebook's Q4 2018 earning report, the social network now has a phenomenal 1.52 billion daily active users. Another thing to note is that the user base of the social media platform has been growing steadily over the course of the past few years as well, although it should also be noted that the rate of growth has been declining. Facebook's latest insights also reveals that it now has 2.32 billion users which is a 2.2 percent increase comparatively previous quarter. All of this is in spite the Cambridge Analytica scandal, numerous other scandals as well as the launch of features such as Watch which did not get all that popular. Whatever Facebook is doing, it’s definitely doing it right as its stock price has increased by 4% over the last quarter.